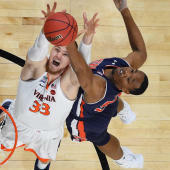 MARTIN, Tenn. (AP) Quintin Dove had 24 points and 15 rebounds as UT Martin topped Tennessee Tech 77-58 on Saturday. Dove made 8 of 10 from the free throw line. Craig Randall had 17 points for UT Martin (8-15, 3-9 Ohio Valley Conference). DelFincko Bogan added 10 points. Jailen Gill had 10 points for the hosts. Hunter Vick had 15 points for the Golden Eagles (7-18, 3-9), who have now lost four consecutive games. Cade Crosland added 12 points. Jr Clay had 10 points. He also had seven turnovers but only four assists. UT Martin takes on Southeast Missouri at home on Thursday. Tennessee Tech plays Jacksonville State at home on Thursday.